Dr.Avnish Jolly, October 3: Life is a mystery to us with something new unfolding every moment. The way we react is entirely up to us. We may slow down when the speed-breakers of life intercept us or we may take them as a platform to rise up, up and above. 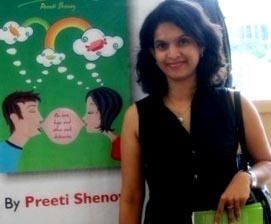 The latter is what seems to be the way debutant author Preeti Shenoy, the author of ‘34 Bubblegums and Candies’, a book filled with inspiration, warmth and of course fun and humour, seems to believe in. This non-fiction is a collection of true stories from daily life, keenly observed and filled with anecdotes. “Most of the incidents described in the book happened to me and some of them to my friends. You may even relate to some of the incidents yourself and see yourself in some of them!” says Preeti. “The underlying message of the book is to live each day fully, without regrets, grabbing each moment, relishing it”, adds Preeti. So to know how many bubblegums and candies will tempt you, making you want to taste them, chew them and relish them, you need to lay your hands on this delicious pack available at a book store near you.